When it comes to choosing a formula for your infant, you only want to provide what's best. Not every infant can tolerate cow's milk infant formula, and you may need to use an alternative such as a soy-based formula. Isomil is made by Abbott Nutrition and is the soy version of Similac. As a soy-based infant formula, there are concerns about its phytoestrogens, which are substances found in plants that may act like the hormone estrogen in the body. Consult your pediatrician to discuss the infant formula that works best for you. 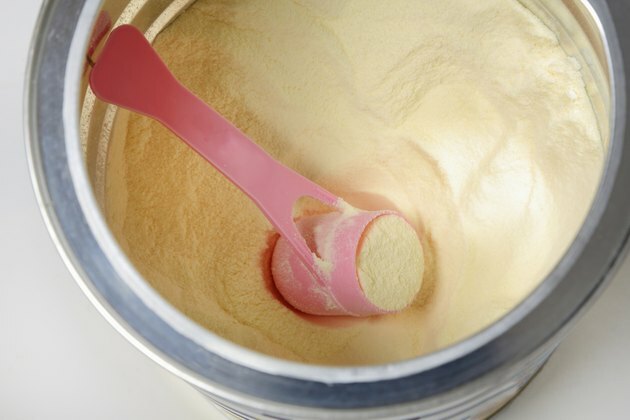 Some parents may begin using a soy-based infant formula for their baby for the wrong reasons, says the St. Louis Children's Hospital. The makers of Isomil say that the formula makes a good choice for fussy and gassy babies. The medical reasons a baby may need to use a formula such as Isomil include lactose intolerance, galactosemia or a milk-protein allergy. Both lactose intolerance and galactosemia are very rare in infants, according to the Children's Hospital. Additionally, infants diagnosed with a milk-protein allergy might also be allergic to the soy protein in Isomil. The American Academy of Pediatrics says the only true need for a soy-based infant formula is for infants with galactosemia or for parents who follow a vegan diet. As your infant's primary source of nutrition, Isomil may increase your baby's exposure to soy and its phytoestrogens, especially during estrogen-sensitive developmental milestones. According to the National Institute of Environmental Health Services, animal studies indicate that high exposure to soy may cause girls to hit puberty early and alter their breast tissue development. However, there is only a minimal concern that infant exposure to the phytoestrogens in Isomil will have any adverse effects on infant development, says NIEHS. There is concern that formulas such as Isomil contain high amounts of aluminum, according to a 2014 article published in World Journal of Pediatrics. Overexposure to this chemical during infancy may affect immune health, bone mineralization and thyroid function. However, other infant formulas, such as cow's milk-based ones, also contain high amounts of aluminum. As an infant formula, Isomil provides all the nutrients your baby needs to grow and develop during that first year of life. While the formula is marketed as a good choice for infants with feeding issues, if you're concerned about how safe it is for your baby, you may only want to use it under the direction of your doctor for its intended medical purpose.